Forecast match Sevilla / Bayern. 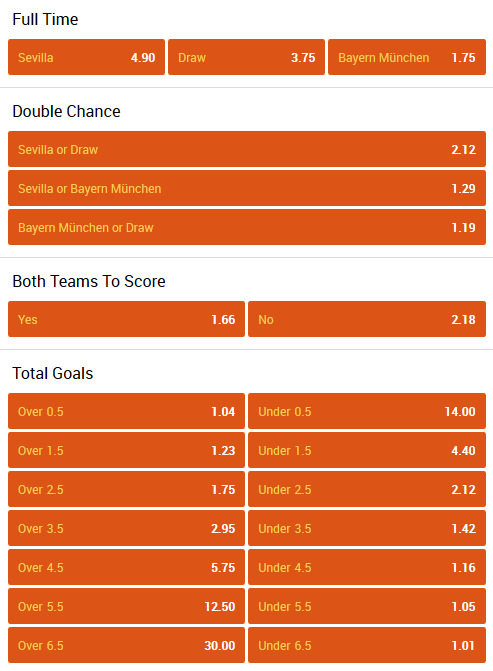 Predict the outcome of the match Sevilla / Bavaria is easy enough for any football fan, it’s enough to see what odds are offered by bookmakers. Bayern, like Barcelona, ​​was very lucky – they fell an opponent, a victory over which should be a 100% result. Seville was able to pass in 1/4 only thanks to the disgusting game of Manchester United and for them it is already a great achievement – the Spanish team made their way to the Champions League quarterfinals for the first time in 70 years. I am fully confident that this will be their last stage in the current Champions League. But, in defense of Seville, I add that Spanish football dominates the world – 4 years in a row the Champions League is won by a team from Spain – Real Madrid and Barcelona. Sevilla was able to knock out of the tournament Manchester United, which speaks of its potential. And in the coming years the trend is unlikely to change. But this time Seville got a serious rival – Bayern just puts pressure on everyone on his way. Last year Bayern scored 5 goals to Arsenal at home, and that after 5 goals away, which were not needed at all. In this season of the Champions League Bayern in the 1/8 finals easily beat Besiktas (total score 8:1). I doubt that Sevilla in the current lineup can stop Bayern. In the first match, I guess, we expect a more or less equal game, where Sevilla will have a good motivation, and Bayern has a huge experience. For Sevilla, even a draw, preferably with a minimum score, will be an excellent result, which will leave intrigue for the return game. But Bayern will most likely play in another football – they need to win at least with a difference of 1 ball to feel comfortable in a home match.